Intimate Worlds - Fleur MacDonald, Stephanie Monteith, Anie Nheu, Catherine Rogers and Kaye Shumack at Airspace Projects. 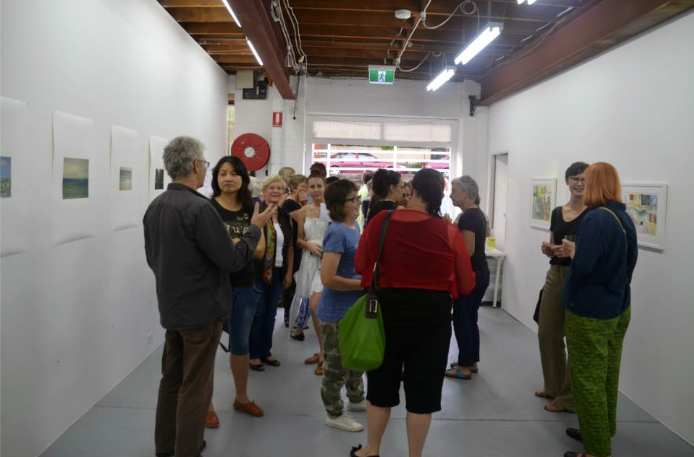 The closing show of 2014 for Airspace Projects is a back to painting exhibition. Like “Sydney Painting Now” showing simultaneously at Pompom we are presented with a statement that painting has relevance and purpose in the contemporary landscape. We are reminded that art of any form can engage and compel if created with a fresh and unique perspective. Anie Nheu’s assemblages are lovely irregular shaped pieces that express the contrasting and conflicting cultural entities she has confronted from a lifetime of geographical displacement. The experience of being constantly on the move has manifested in the works that express an ultimately harmonious resolve. Stephanie Monteith, whose work has been seen most recently at the James Dorahy gallery has contributed a series of intricate finely painted flora on wood. There is an exquisite prettiness to these small paintings in this configuration but they apparently play a role in a larger more ambitious project that is an evolving work in progress. Fleur MacDonald backs up from her wonderful show at the Drawing Room with two brightly coloured depictions of her favourite objects and icons. They are very direct and robust images that portray an animated fascination with popular culture and the recently retired mascot of sixtoeight Pengee. There are witty light pop elements that convey a layer of cultural identity that triggers a deeper subliminal connection to a time and place. Catherine Rogers contributes pieces that are not painted. They are digital images of……paintings. She has compiled images of art taken in various museums and galleries over time. These have been selected for their similarity in composition and subject matter. The works are by famous painters though this is not the point as much as how they interact together as a series of images. Their common thread is aesthetic rather than historical. Finally a suite of joyful painterly observations by Kaye Shumack round off an eclectic body of works that present a freshness of vision consistent with this relatively new gallery’s shows to date.